Be inspired, uplifted, expanded and energized! Doors open at 5PM. Event continues to 11PM. 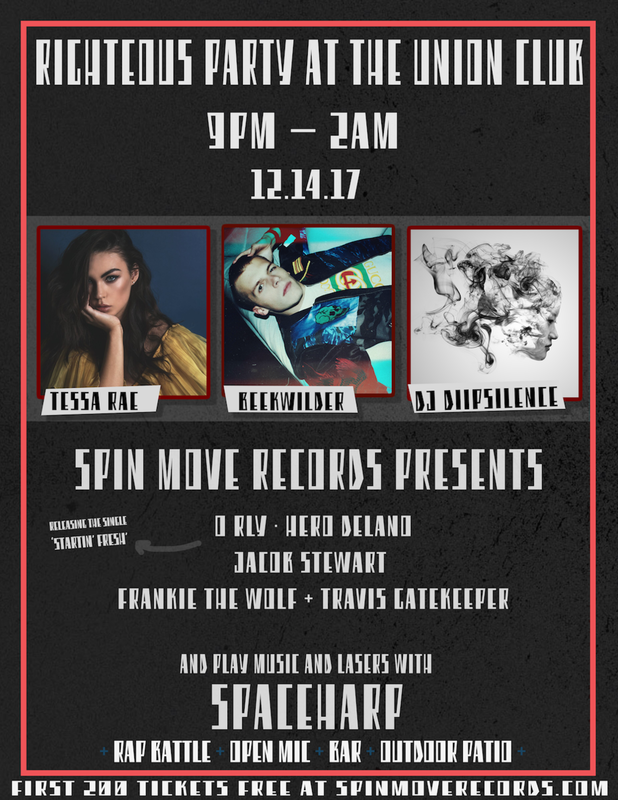 SpaceHarp is pleased to announce it is co-sponsoring it’s exciting, immersive player-interactive installation for the Glendale Tech Week 2018 Awards Party. Thursday, May 24th, 5:30PM to 8:30 PM. PLEASE NOTE SPACEHARP CONCLUDES ONE HOUR BEFORE THE WHOLE ART WALK ENDS. Come and enjoy the Santa Barbara 2018 LIVE Art & Wine Tour, including a spectacular interactive music and art installation, featuring the SpaceHarp motion music system, at the Bobcat Room. Just move your body over the SpaceHarp controller, and effortlessly create music, 3D Video visuals and laser animations! Click here for further information on the Bobcat Room, including map information. We invite you to come and PARTY with us at the Union Club LA, Thursday December 14th, 2017, from 9PM to 2AM. One ticket includes both rooms! There are a limited number of free tickets available with advance RSVP. Only $5 general admission at the door. We are pleased to announce that an exciting new configuration of SpaceHarp motion music controller will be making an appearance this Saturday December 2nd at the Art House open house in Pacific Palisades, 12 noon through 7 PM. This new SpaceHarp interactive setup is an intimate, personal art installation where guests may effortlessly create music with magical laser and video art. This is an art house open house art showing. 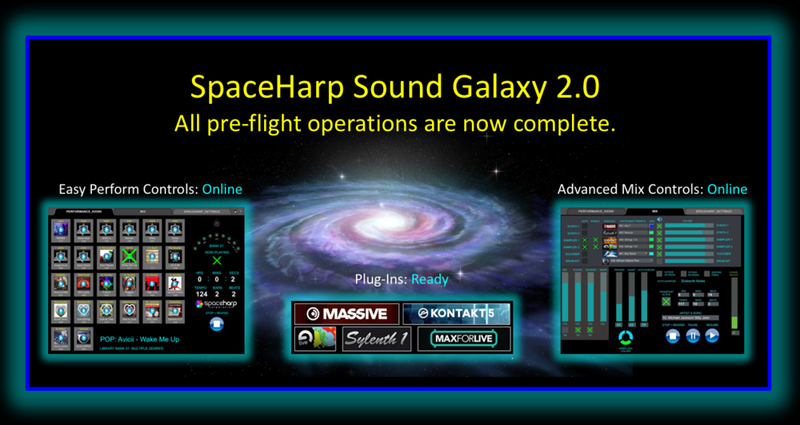 SpaceHarp Corporation is pleased to announce the release of the Sound Galaxy 2.0 Software Tools Suite User Guide. Additional User Guides for SpaceHarp MIDI Controller & Standard Accessories, and for SpaceHarp Performance Systems, have also been released. SpaceHarp Corporation is pleased to announce the release of the SpaceHarp Performance Systems User Guide. Additional User Guides for SpaceHarp MIDI Controller & Standard Accessories, and for the Sound Galaxy 2.0 Software Tools Suite are also being released. SpaceHarp Corporation is pleased to announce our release of the SpaceHarp MIDI Controller and Standard Accessories User Guide. Additional User Guides for SpaceHarp Performance Systems and for the Sound Galaxy 2.0 Software Tools Suite will also be released this week. SpaceHarp Corporation is pleased to announce the release of its Sound Galaxy 2.0 DAW Software Tools Suite. These new tools hosted on a DAW computer, super-charges SpaceHarp controllers and fully exploits their articulate and rich live MIDI data stream. Used both for live performances and interactive music attractions, the Suite manages a collection of widely-used professional DAW applications. These include Ableton Live, Max, Max-for-Live, Native Instrument's Massive and Kontakt, Sylenth and the Hotz Translator auto-harmonic software engine. The Easy Performance Tab (shown above left) provides single-touch to launch of pre-configured baking tracks and enhanced live musical performance. The Advanced Mix Tab (shown above right) includes enable/disable of plug-ins; instrument layer volumes and mutes, sub mixes and mains; SpaceHarp's patented auto-quantization and sustain settings, and more. Also included and automatically pre-configured are Sound Galaxy's Ableton templates, remote control screens, instrument and effect packs, and SpaceHarp's powerful behind-the-scenes MIDI processing. In Sound Galaxy 2.0 these all work together seamlessly to empower a new universe of creative musical possibilities for live performance while remaining "in the flow." Sound Galaxy now includes an Auto-Launcher, which boots up and configures all the DAW applications, templates, tools, instruments and effects automatically. With a few mouse clicks, a Sound Galaxy 2.0 user can automatically go from a cold power-up of the DAW computer to live command of the system for a stage performance, a guest-interactive experience, or a multi-player theme park attraction. Full information may be found in the Sound Galaxy 2.0 Software Tools Suite User Guide, and in the companion SpaceHarp MIDI Controller & Standard Accessories User Guide. Full information about turn-key DAW systems, pre-configured and suitable for the above mentioned applications, may be found in the SpaceHarp Performance Systems User Guide. paceHarp touchless motion music and visuals controller in Vortex Dome LA. SpaceHarp player generates live music and seamless fulldome art! Chris Adams, SpaceHarp's Creative Director, voted one of "Top Ten DJs at SXSW"
Chris Adams (AHEE) SpaceHarp's Creative Director, was today listed as "0ne of the Top 10 DJs" at South by Southwest (SXSW) Conference. Stay tuned for upcoming announcements about AHEE and SpaceHarp participation in upcoming festivals and events! We are pleased to announce that Brett Leonard, the international luminary film producer/director/writer, futurist and VR visionary, has joined the SpaceHarp Corporation Board of Advisors. Brett has been a long-time associate and friend of SpaceHarp's founders. He previously participated in funding an early SpaceHarp prototype and in other early-stage developments. Brett now moves forward in a closer strategic relationship with the Company, and is excited to join into and further expand the vision and mission of SpaceHarp. Brett brings decades of expertise and global success in digital media, Virtual Reality (VR) and Augmented Reality (AR), award winning films, advanced technologies, strategic alliances and storytelling on digital platforms. Brett is currently Chief Creative Officer at Virtuosity VR in Los Angeles. SpaceHarp is pleased to announce that its Sound Galaxy Tools Suite for its SpaceHarp Touchless Motion Music Controllers now supports both Android and iOS devices, including various device sizes including iPhone/Android phone/iPod, iPad mini/Android mini tablet as well as iPad/Android large tablet sizes. In addition, both of the supported remote control interface technologies used (Touch OSC and MiraWeb/MaxMSP) may be used on the same device simultaneously, and players can rapidly switch between the interface screens. For example, an Android device (such as a Samsung Galaxy Tab mini tablet) can control ALL Sound Galaxy Suite applications without the player ever having to touch the Sound Galaxy host DAW computer. In addition, Sound Galaxy supports 100% controls sync - even between remotes on Android and iOS - change a control on either type of remote, and the other remote(s) as well as Ableton and instrument controls change, maintaining perfect control sync between all devices. MiraWeb's easy access to MAX MSP patches on the host can also run on any wireless connected device that can run a web browser, including any computer or netbook. MiraWeb also supports multiple interface tabs, making the control screens less cluttered and with larger, more readable controls. For stage performance, studio sessions, LBE applications development, and LBE Kiosk operations, this new level of support and integration will bring added convenience as well as lower the cost of remote devices that may be used together with SpaceHarp Controller and Sound Galaxy Tools Suite. Screenshots were updated February 13, 2017. The Company will be demonstrating its incredible SpaceHarp touchless motion music controller. There will also be an opportunity to schedule 1-on-1 private meetings between interested investors and SpaceHarp management. If you register before Monday, October 24th and qualify to attend, you'll be able to receive additional information in advance of the event, about the Company and its potential opportunities for qualified financial partners. Expo attendees will be able to experience a product demonstration and can play the SpaceHarp directly - just "Move and Make Music". Note there is also a series of panel discussions that will provide a wealth of great insights. Please be sure to pre-register before coming to attend! We are very excited to share that SpaceHarp Corporation has just signed a major strategic technology alliance agreement with KiwiTech, LLC for their help in our mass market software app development. We feel this will accelerate the introduction and use of SpaceHarp controllers for a very broad demographic of users, including bedroom musicians and even aspiring musicians, by adding a universal app for our hardware. This will also aid in our future hardware products being easy to use in the form of fully mobile connected devices. Mixer and demo time is 6:30 to 7PM. Presentation is at 7:30PM. It is with great regret that we have accepted the resignation of David Warman from the SpaceHarp Corporation Board of Directors, due solely to personal issues. The Company wishes to express it's gratitude for David's continued and future participation in a less demanding form. "I hold the greatest enthusiasm for SpaceHarp Corp., for its vision, mission and product. I am therefore pleased that the company has accepted my continued participation as a member of its Board of Advisors." Moving forward, the Company is engaged in discussions with industry experts, strategic partners, potential investors and other visionary individuals to fill the vacant seat on its Board of Directors. SpaceHarp Corporation is pleased to announce that it now offers a wide range of spectacular laser effects in it's Event Option Packages. Provided in partnership with DayStar Lasers International, an internationally acclaimed, award-winning full-service provider of laser shows and effects since 1993. CLICK HERE TO FIND OUT MORE ABOUT SPACEHARP EVENT BOOKINGS AND OPTION PACKAGES.